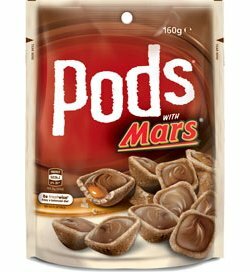 Crunchy wafer in the shape of a shell, filled with Mars caramel and topped of with smooth and creamy milk chocolate. This all creates an array of textures and flavours that keep your taste buds guessing. Sugar, Milk Solids, Wheat Flour, Glucose Syrup (Wheat), Palm Fat, Cocoa Butter, Cocoa Mass, Barley Malt Extract, Emulsifier (Soy Lecithin), Cocoa Powder, Salt, Flavours. There are more chocolate than biscuit but the family love them and I would definitely recommend them! These are wonderful, I was addicted when I was in Aus. They have a thin bisuit cup that is filled with caramel and chocolate. They are found in the lolly and chocolate Aisle in Big W, Coles etc, so I would say Choccy rather biscuit. These are wonderful little biscuits you can have with your tea in the afternoon, or you can carry them with you everywhere you go, though they wont last for long as they are scrummy.